What do you do with that last little bit of wine? Do you save it for the next day, knowing it will be so-so? Do you pour it out, but feel guilty because you are a resessionista and waste nothing? Do you go ahead and drink it, just for the sake of it? These are my life questions at this very moment. Next time you find yourself in this situation – shake that bottle for every last drop and bake your little bit of wine into a pan of deep, rich, and fudgy chocolate brownies. These brownies get a double-hit of chocolate from both semisweet chocolate and unsweetened cocoa powder but you could go all triple-threat and fold in chocolate chips to the batter if you had them on hand. The wine intensifies these little buddies and brings out major chocolate flavor. 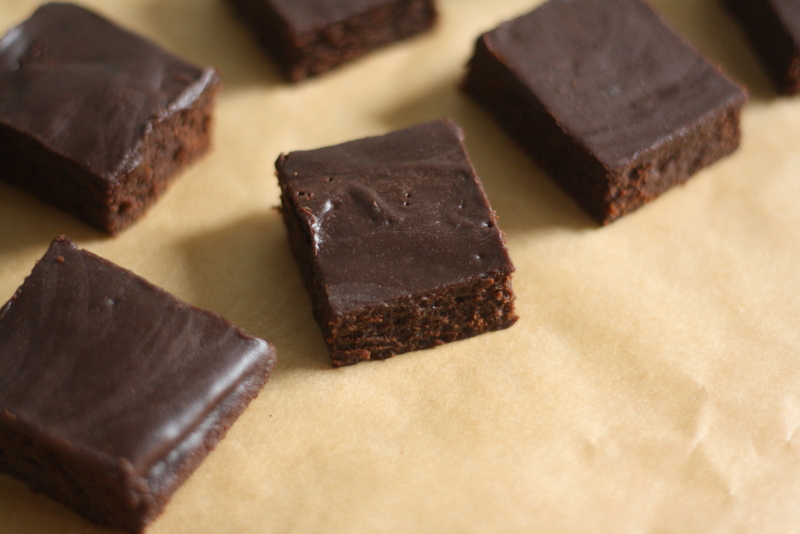 These are brownies that are not messing around. 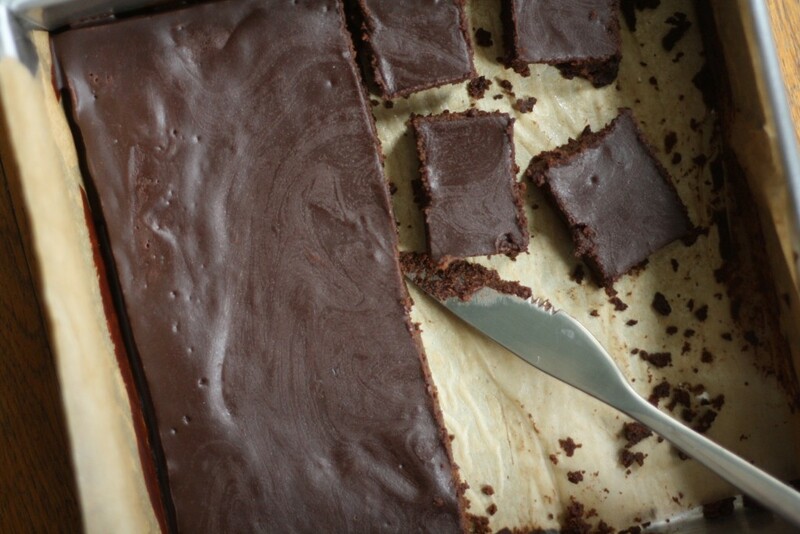 I also suggest not skipping the glaze – you can make it while the brownies bake – but the thin spread of red wine chocolate goodness is well worth the extra step. As the layer of fudge sets the wine flavor becomes more pronounced and turns a humble pan of red wine brownies into an ultra-decadent and fancypants glazed dessert. Preheat the oven to 350. Butter an 8×8 pan and line with two sheets of parchment paper, then butter the parchment. Set aside. In a large bowl whisk together the eggs, sugars and vanilla. Whisk in the chocolate mixture and then the wine. 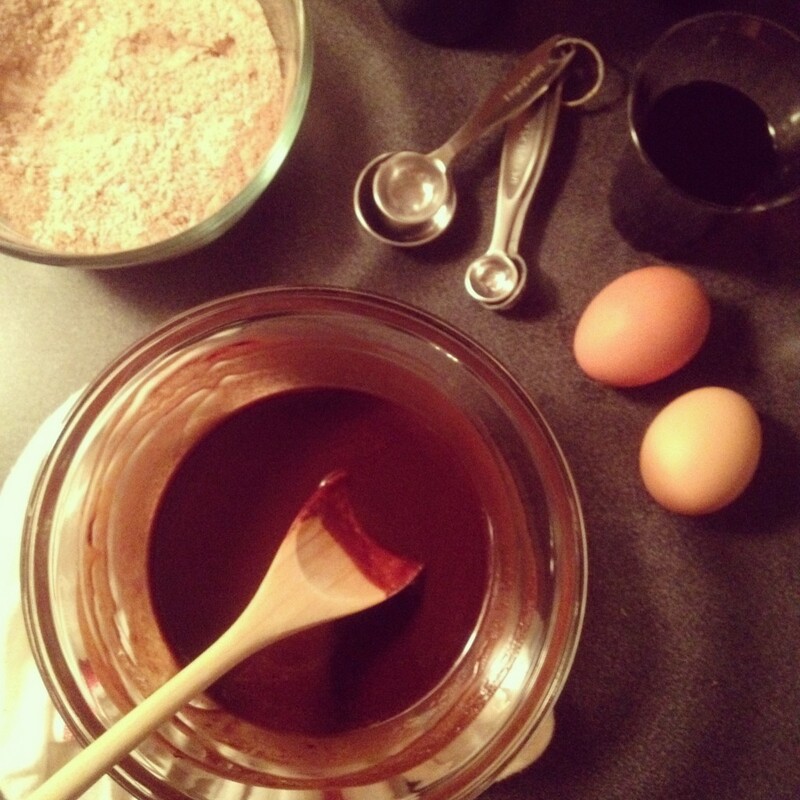 Add the flour, cocoa powder and salt and stir until the batter is smooth and has thickened slightly. Fold in the chocolate chips, if using. Pour into the prepared pan and bake for 15-20 minutes or until a tester comes out mostly clean with just a few crumbs attached. You may need to bake the brownies for a few minutes more, but set your timer for 15 minutes and then hang out in your kitchen for the last few minutes of baking time just to make sure they don’t over bake. An underbaked brownie is better than an overbaked one. While the brownies are baking make the glaze. Melt the chocolate in a heatproof bowl set over simmering water until melted. Add the butter, wine and salt and whisk until smooth. 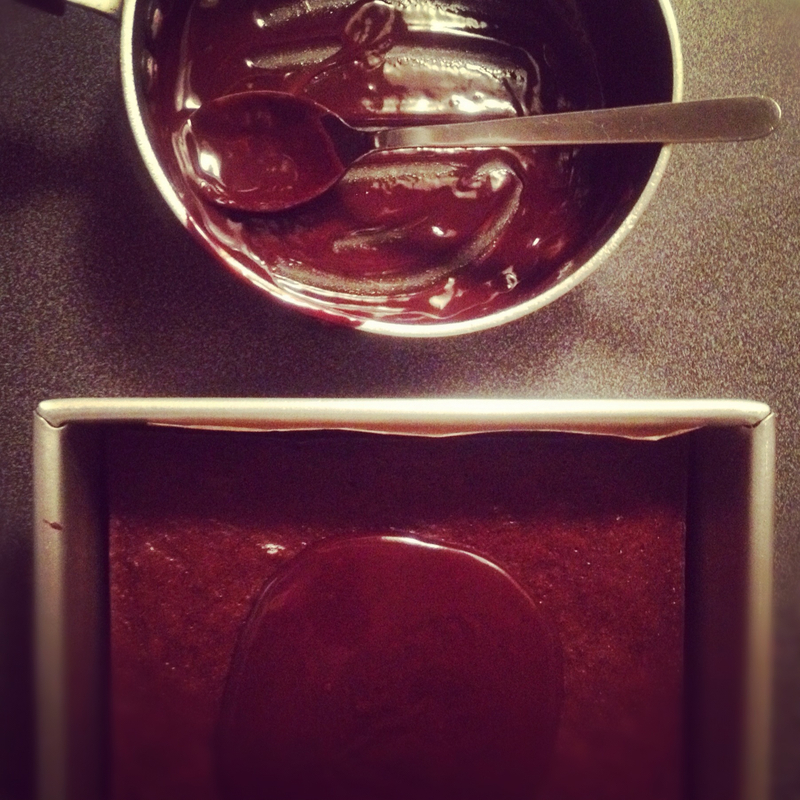 Pour the glaze over the warm brownies and spread it to the corners so the top is evenly coated. Thank you for posting them on your blog and they look great. I’m happy to hear that you experimented with red wine even if its not your favorite and I’m glad that your family enjoyed them! Happy baking! Always have that left over bit that is a shame to waste. A definite ‘try’ on my list! I think the baking time needs to be adjusted… I have an excellent oven it took the brownies 30 minutes to bake at 350*. I am an experienced baker and I followed the recipe exactly. Just made these brownies tonight and they are sublime! I did have to bake for 28 minutes but I’ll admit that my oven is a little wacky. Thanks so much for posting this recipe! I am so happy to hear they were enjoyed!! Yay! 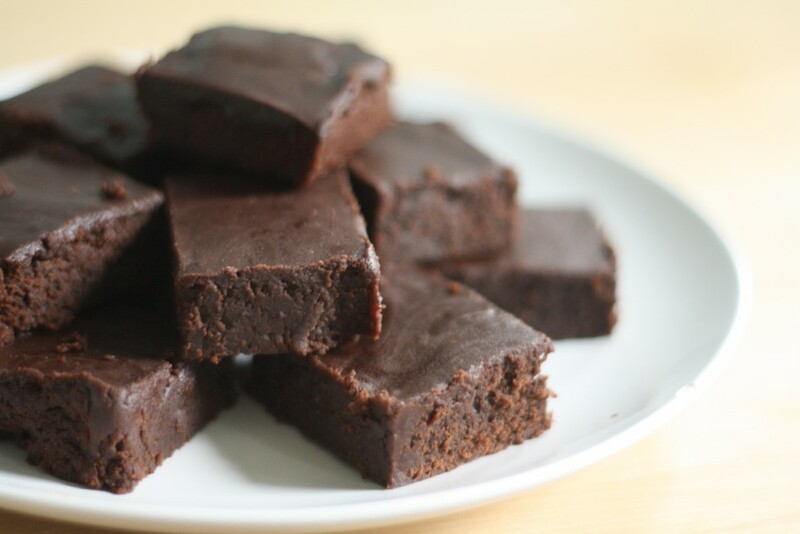 I made these brownies this morning and I think they are delicious! I did not make the glaze for them because I started working on other projects and forgot. I also forgot to add chocolate chips which my brownies desperately needed because they are pretty dry. I am not sure why mine turned out so dry, I followed the recipe exactly minus the optional chocolate chips. I can understand if you like red wine these might not be too appealing, but I almost think they could use more wine. I am going to try and make the glaze now to give it some more wine flavor, thank you for the recipe! I am definitely going to make this again and not forget the chocolate chips. Happy to hear they were enjoyed! To help avoid them from drying out on the next batch, I’d take the pan out a few minutes before you think they are done since they’ll continue to cook in the pan. Happy baking! That is a good recommendation, thank you. I thought about it and there are two things I noticed but forgot about. First, the brownies baked very unevenly in my oven and I think that was because I left my pizza stone in the oven. So the probably baked too long. I also used a mixture of whole wheat flour and white flour. I do this with everything I bake and I don’t think it compromises the texture or flavor at all but I think using whole wheat flour requires more liquid. I am going to try another batch tonight and use your recommendation plus some changes of my own. I have only been baking for about a year so I expect to have some problems in the beginning. Of course! Hope round two is a success. Happy baking! I made these for a friends birthday, they were a big hit!! So delicious I have made 2 more batches since the party!! Hi. What kind red wine use? Anything you have on hand!